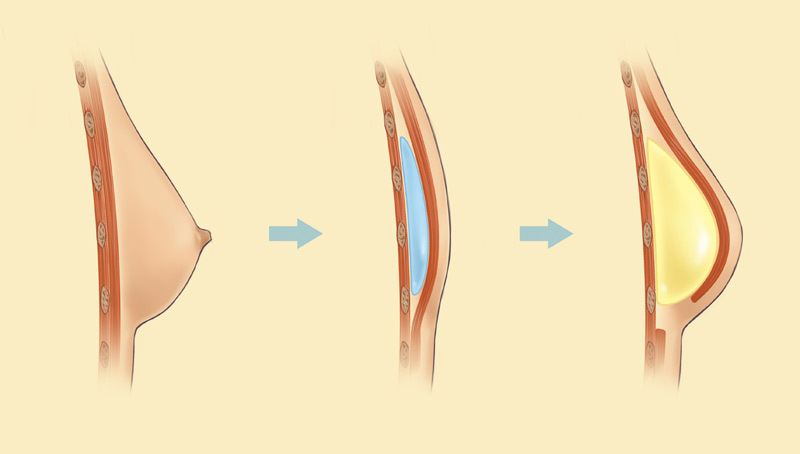 This form of reconstruction involves placing an implant under the chest wall muscle and skin. It is usually done as a two stage operation. Firstly an inflatable balloon (tissue expander) is placed under the muscle. This is inflated with a series of injections of saline water to stretch the skin. A permanent implant is then inserted 3-6 months later. More recently implant reconstruction can be offered as a single stage operation. This has the advantages of maintaining the breast skin and allowing more natural ‘looseness’ to the breast. It requires the use of special materials to be used in addition to the implant to help support the implant internally. This is either a man-made material or a specially prepared animal skin product. If one-stage implant reconstruction is an option this will be discussed with you. – When carried out as an immediate reconstruction it only adds a little extra surgery to the original mastectomy operation. – This technique avoids additional scarring on the rest of the body. – For a lot of patients the implant will create a very pleasing breast shape. – The recovery rate for the operation is relatively quick. – The shape of the breast will have little or no natural ‘droop’ and can therefore appear less natural in matching the other breast. – There are two operations for the patient to undergo, and therefore involves more recovery. – There are some issues associated with having implants, including the implant causing the breast to harden (usually in 30% of patients) and a small risk of infection resulting in implant loss. See implant problems for further information. – The implant tends to give less symmetry over the years, as it will not change in shape or size in the same way of the normal breast. If you are a smoker, try and stop for a six weeks before and five days following surgery as it can reduce the chances of complications. – Length of stay in hospital – usually 4 days for both operations (which will be done over 4-6 months). – Length of surgery – usually between 1-2 hours. – Time to walking – patients should be able to walk 1-2 days, and walk without any discomfort after a week. – Time to exercise – patients should be able to exercise after 4 weeks of recovery. – Time to full recovery – patients should feel fully recovered and be able to return to work by 6-8 weeks. – Driving – Patients should avoid driving until they are completely free of pain and restriction, and be able to confidently perform an emergency stop. This is to ensure they will be covered by their insurance policy. It may take up to 3 weeks to recover sufficiently. – Dressings – patients will wear dressings on the breast for 2 weeks. – Bras & clothing – patients are advised to bring a soft (non underwired) sports bra in the planned new cup size into hospital. The bra should feel comfortable, whilst still providing support. You will need to have two bras at home that can be worn on rotation. The chest measurement does not usually change but can reduce by 1-2 inches. You will be able to wear an underwired bra after 8 weeks; this should be properly fitted to your new shape and size. – There is around a 3% risk of fluid collecting in the reconstructed breast and an infection occurring. This would need to be treated immediately. – As with any implant surgery, there is up to a 30% risk of the implant becoming ‘firm’, as well as there being some assymmetry to the opposite breast. – There are no problems associated with the ‘donor’ areas of the body that skin has been taken from following surgery.